Besides slide transitions, the most common type of animation in PowerPoint 2013 is adding entrance and exit effects to the text that appears on the slide. This effect is especially useful for bullet lists because it lets you display the list one item at a time. You can have each item appear out of nowhere, drop from the top of the screen, march in from the left or right, or do a back somersault followed by two cartwheels and a double-twist flip (talc, please!). This type of animation is often called a build effect because it lets you build your points one by one. It’s easy to apply this type of animation using the Animations tab of the Ribbon. Preview: This group includes a single control — a Preview button — that displays a preview of the animation effects you selected for the current slide. Animation: This group lets you select one of several predefined animations for the selected object. Advanced Animation: The controls in this group let you create custom animations with features that the basic animations provided by using the Animation group. Timing: This group lets you set the timing of the animation. To apply an animation effect, first select the text box that you want to animate. Then, choose the animation style from the Animation gallery on the Animations tab. Like other PowerPoint galleries, the Animation gallery includes a More button (at the bottom right) that summons the complete gallery. 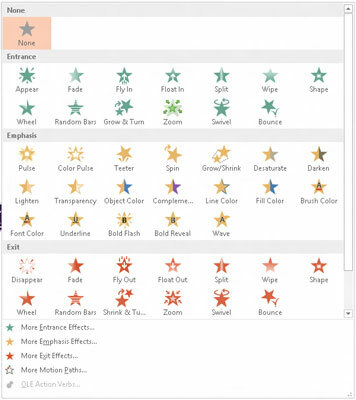 After you apply a basic animation, you can use the Effect Options drop-down list to select one of several variations of the animation. For example, if you choose the Fly In animation, the Effect Options drop-down list lets you pick the direction from which the object will fly on to the slide. Notice that there are several More. . . menu items at the bottom of the Animation gallery. You can click any of these buttons to reveal even more preanimation types.